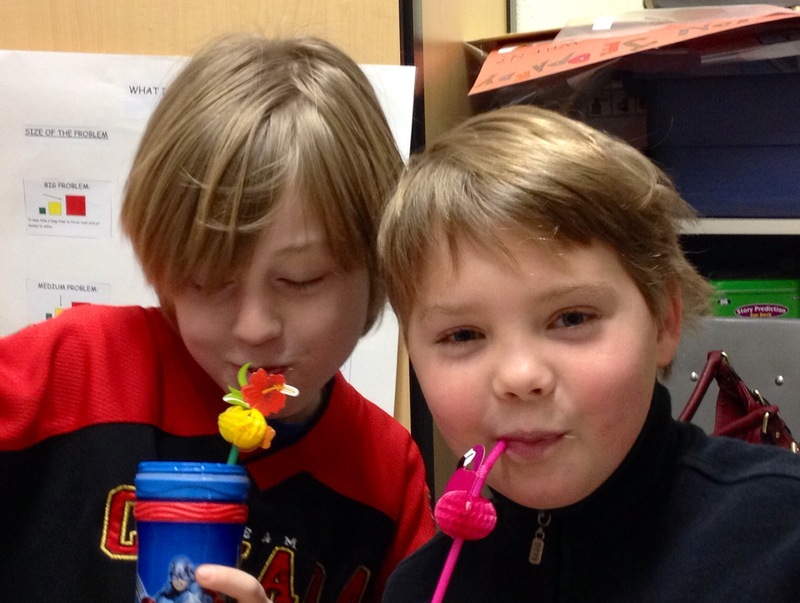 When I got out the fun straws on Tuesday I guess I was trying to handle MY winter blahs. The lunch buddies asked, “Winter blahs? What does that mean?”. Clearly they are not feeling the impact of all these snow days like I am. Flamingos and hibiscus add a little fun to the group. 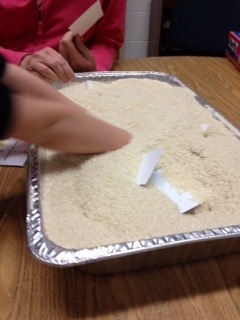 The third grade groups focused on interest vs. disinterest. What does disinterest look like? How do we adjust our behavior when we see our conversation partners showing disinterest? 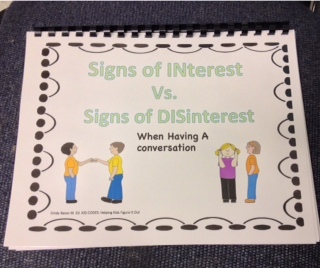 I made this booklet from Cindy Basso’s Conversation: Signs of Interest vs Disinterest. This product is available for purchase on http://www.teacherspayteachers.com. It is important to be able to use our perspective taking skills during conversations. The lunch buddies discussed what it means when we see the signs of disinterest. It doesn’t mean that someone is not interested in us, just what we are talking about at the moment. All this led to a discussion of the “Social Fake”. We can show signs of interest, even when we are not, to make our friends feel good. Teachers like it when we show signs of interest. 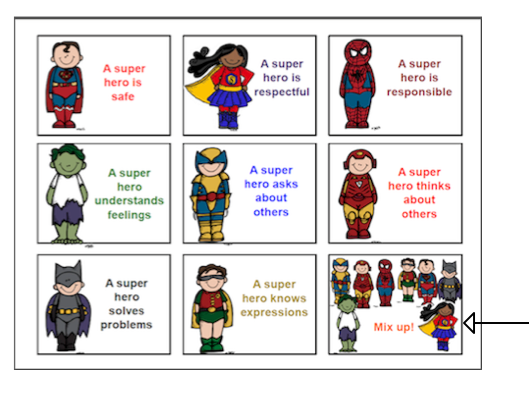 I have used many of the Social Skills units from http://superpowerspeech.com with the Lunch Buddies. Now, there are No Print Activities available to use in conjunction with these units. I purchased them at http://www.teacherspayteachers.com for $5 and $6 each (a real bargain!) and downloaded them onto my iPad. While I was doing all this it occurred to me that parents could use these at home during the snow days, school holidays or any day, really. The three No Print Activities are in the form of a pdf which includes over 150 cards each to help kids practice skills. Parents, check them out. Go to http://www.teacherspayteachers.com. Search Super Power Speech for Space Hero Social Skills No Print Activities, Magical Social Skills No Print Activities, and Princess Social Skills No Print Activities. Nothing better than a Snow Day! I think we may get 2 or 3 snow days out of this storm. Stay safe and have fun. 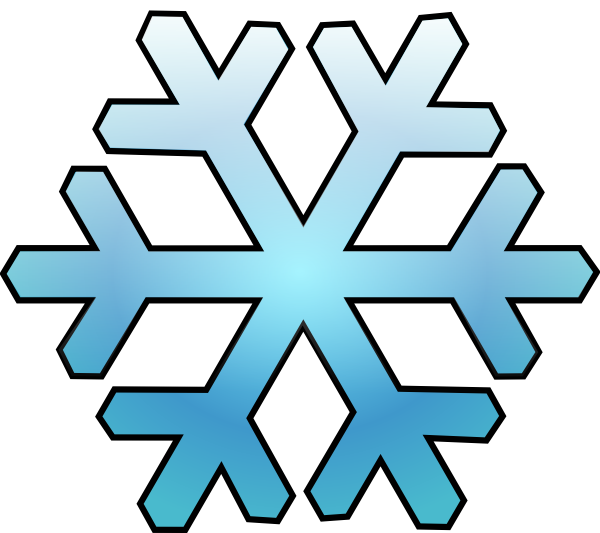 Trying very hard to get into Snow Day mode but my brain is in high gear. I am working on a Power Point presentation for a staff development on February 5th, making and printing visuals for the lunch buddies groups, and planning for Autastic Avenues. Maybe if I turn on the Bravo channel I can turn everything else off!! We had a super fun day at the Autastic Avenues workshop yesterday. We used movie and video clips to promote social learning. Pizza, Popcorn, and Friends! Check it out on the blog at http://www.autasticavenues.com. Meet our mascot, Crash the ferret. 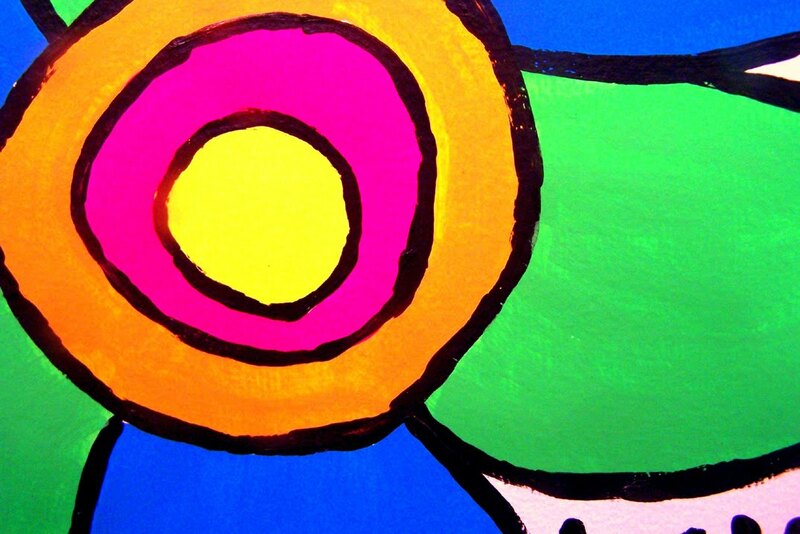 These colors are sure to brighten your day! As a continuation of the post from yesterday, I want to show you how I extended the social thinking concepts with different groups. 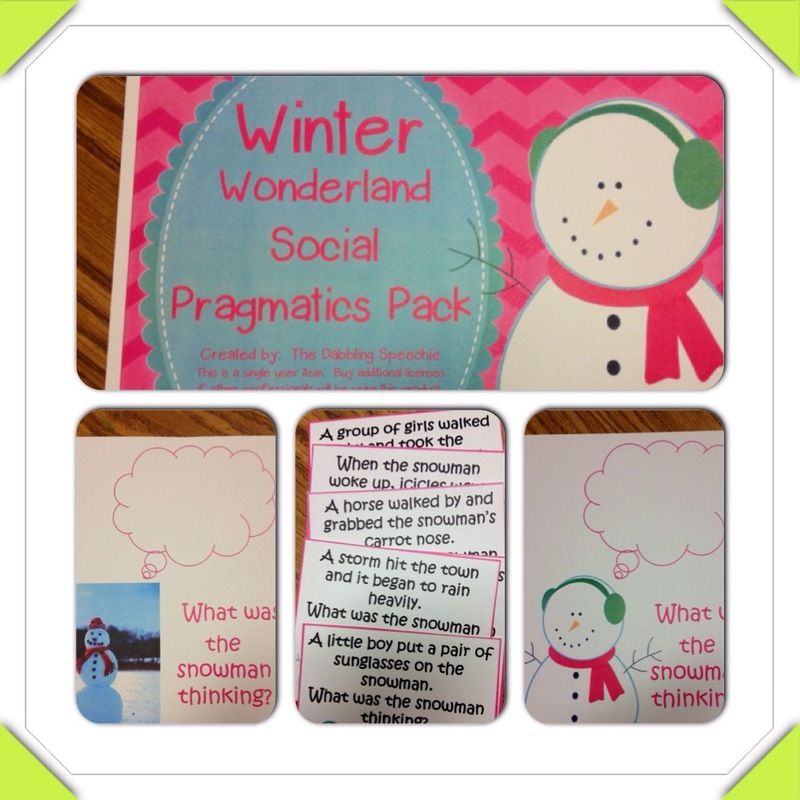 Winter Wonderland Social Pragmatics Pack is the creation of The Dabbling Speechie and available for purchase on http://www.teacherspayteachers.com. 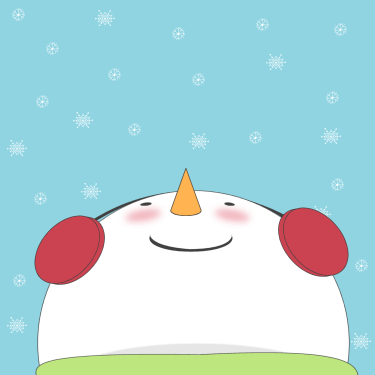 It is really hard to put yourself in the snowman’s place or pretend to be the snowman when a horse walked by and ate your carrot nose. 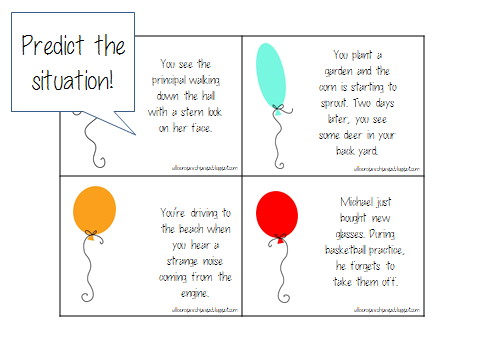 We used this pack to create “what if” scenarios that must be jointly imagined. 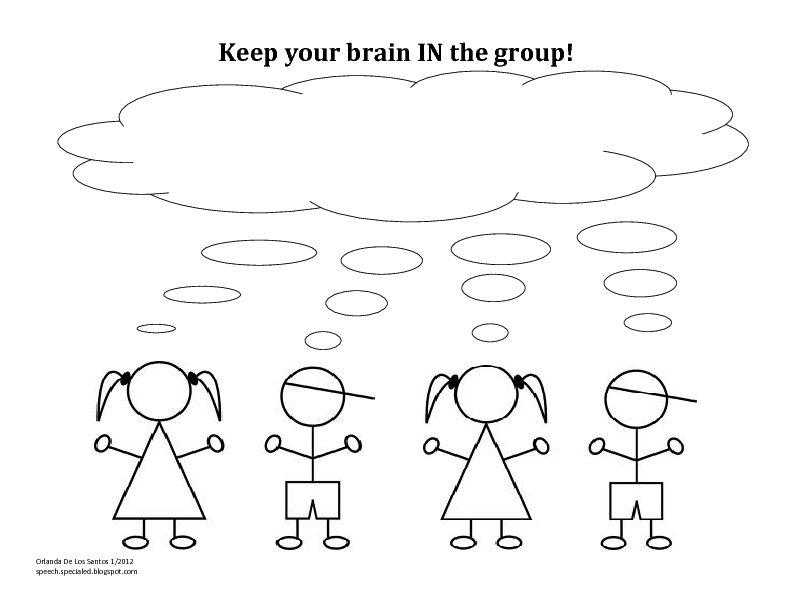 Sharing an imagination leads to success in: learning as part of a group, having a conversation, reading comprehension, and personal problem solving. I believe it is important that classroom teachers/exceptional education teachers join us in our social skills groups. We were joined by Mrs. Ogden last week. 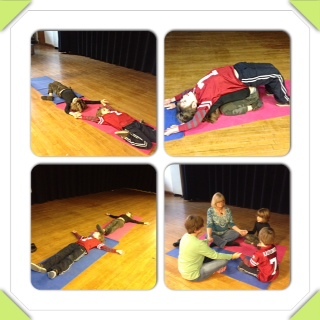 She was very impressed by our group yoga poses and she really liked the Community Circle. Teachers and parents are always welcome to join a group. It is important that we “climb as a team”. I was able to use the same books and visuals , with minor adjustments, for different age groups. I printed and laminated this visual to use as a dry erase board with different groups. I just wrote the group plan in the thought bubble. It is the work of Orlanda De Los Santos at http://speech.specialed.blogspot.com. 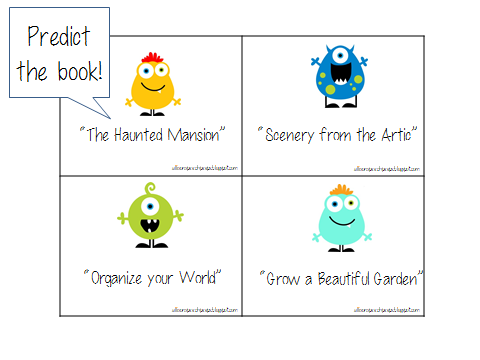 Visit the blog for more great ideas for visual supports. I was thrilled when Abbie, a kindergarten student in Mrs. Lindstrom’s class asked me “What is the group plan today, Ms. McCallister?”. 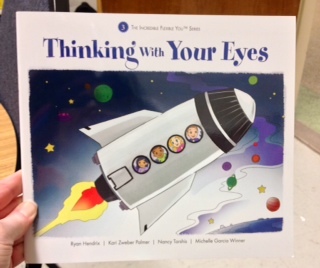 We read Thinking with Your Eyes, a book which is part of the Incredible Flexible You curriculum. For more information go to http://www.socialthinking.com. Whatever someone is looking at is usually what they are thinking about. Next we read Duck on a Bike. What a great book to extend the concept. The animals in this story are thinking with their eyes, watching Duck ride a bike around the barn yard. The animals say one thing but are thinking something else. 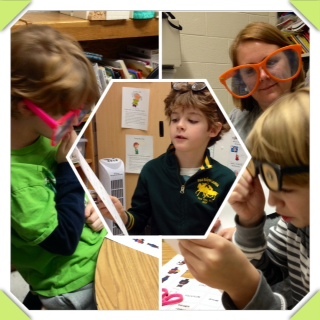 It was fun to think with our eyes and make smart guesses about what they are thinking. 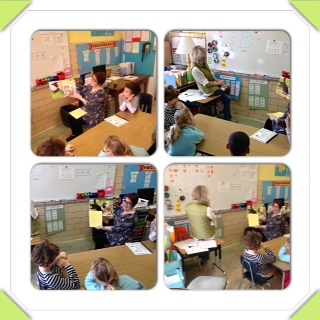 Here we are in Book Chat, the co-taught 3rd grade reading comprehension class. We are using the same book but in a slightly different way. 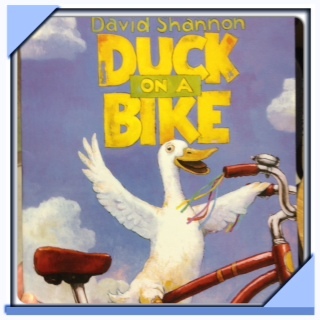 We are using what we already know or have experienced concerning the animals in the book to help us make smart guesses about what that animal is thinking about Duck riding a bike. For example, we know that goats will eat anything. So, a smart guess would be that Goat is thinking , “That bike looks tasty” or “I sure would like to eat that bike”. One teacher is acting as the recorder of ideas and filling in the thought bubbles and speech bubbles, while one teacher is scaffolding the discussion. Bright ideas flow in this class! Oliver & Hope’s Amusing Adventure is now a lunch buddies favorite. The characters in this book show the students how to focus on what you do have and not on what you don’t. Oliver and Hope encourage each other when the going gets tough. They use creative problem-solving that leads to big fun. 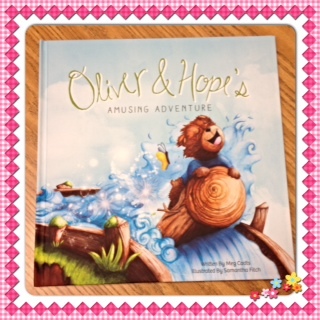 Oliver & Hope’s Amusing Adventure is available at http://www.uhccf.org/oliverandhope/. Enjoy the long weekend, everyone! Autastic Avenues will have a super fun social skills workshop on Monday. We will use movies and video clips to teach social thinking skills. There will be games galore to help build executive function skills. There will be popcorn and pizza, Oh My!! The lunch buddies focused on impulse control today. First, we read this flip book. 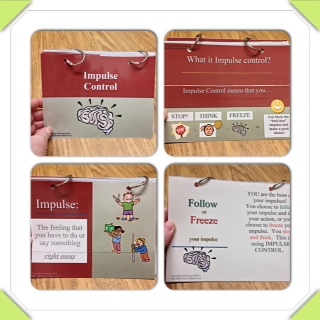 We learned what impulse control means, what it looks like, and how to use it. Block the bad idea impulse and make a good choice. We are the boss of our impulses, they are not the boss of us! 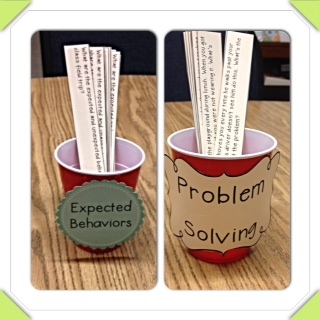 While we ate lunch, we took turns picking a slip from the Expected Behaviors cup or from the Problem Solving cup. On each turn, the scenario is read and that person explains the expected/unexpected behaviors or identifies a problem and how to solve it. 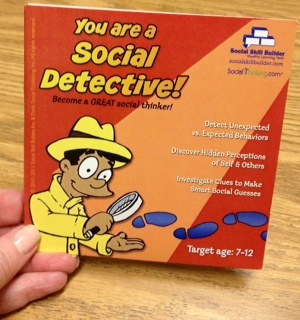 Check out the Social skill breaks packet created by Felice Clark, The Dabbling Speechie. It is available for purchase at http://www.teacherspayteachers.com. We played Spot it! That game requires a great deal of impulse control. We talked about how they might have the impulse to peek at their card before I said the word Go! but they could “block it” and make a better choice. They might have the impulse to stand up out of their chairs but they could “block it” and make a better choice. They might have the impulse to scream out but they had a strategy to use instead. Friday is the day that the first grade girls get together for lunch and social skills. We played a Bean Bag Toss Conversation Game. Those pages on the floor have statement stems printed on them. 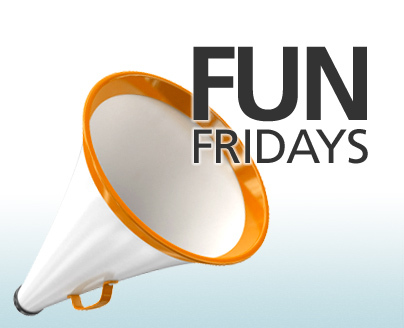 Some example statements are, “My favorite place is… ; If I won a million dollars, I would…; When I grow up I want to be… etc.” Everyone gets a turn to toss the bean bag. Whichever page the bean bag lands on, the player turns it over and reads the statement stem and complete the sentence. After the player completes the statement they choose a friend and turn the statement into a question. The players keep the conversation going by making comments and asking further questions. As you can see from the photo collage the girls are referencing their conversation partners with eye contact. I am behind the group taking the photos, so they cannot look to me to facilitate! Maddie said that her favorite place to be was school and that she wanted to be a teacher when she grows up! Betsy wants to be a doctor then a vet. 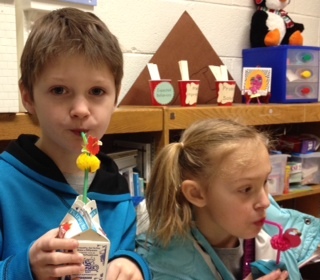 I learned a great deal about these lunch buddies by listening to their conversation! 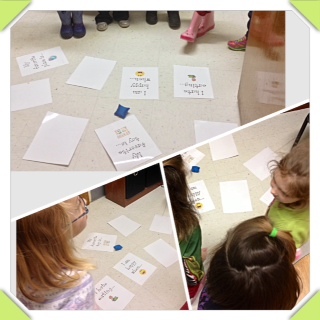 The Bean Bag Conversation Game can be found at http://acardenas.weebly.com/lessons.html. Angela Cardenas has posted many great lessons there. We played a game of Zingo! in Mrs. Allgeier’s room. The “big sentences” were booming around the table! The student working on being a Social Detective is progressing nicely and on level 5. Our little guy had such a good time with this big pan of rice! 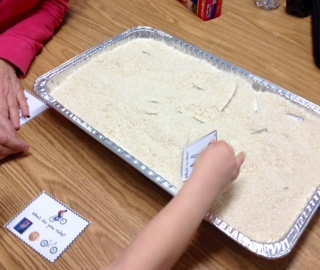 Picture cards were hidden in the rice. 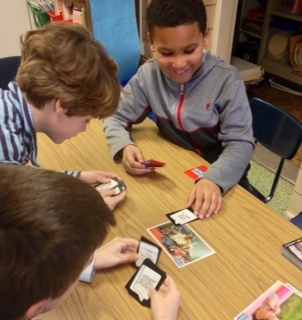 We took turns finding the correct card to answer simple Wh questions. At first, he needed some assistance to find the cards that were hiding deep in the rice. Once he found out how fun it was to dig deep into the rice, it was hard to wait for a turn. 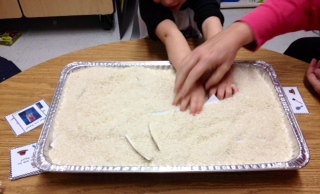 This activity turned out to be a super way to start the new year! The Wh-question/answer pictures and activity were created by Lisa Hatzinger and available for purchase from http://www.teacherspayteachers.com. The name of the activity is “What” Questions- A Multi-Step Approach for Making Wh-Questions Meaningful to Early Communicators. Thumbs Up for the new games! 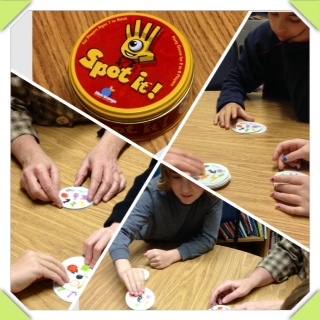 We all love Spot it! What a versatile game! Playing Spot it! 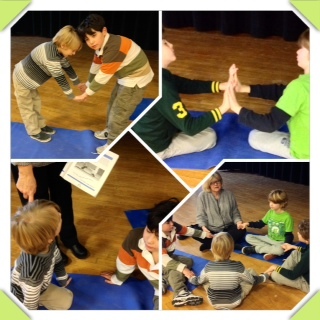 helps develop many skills, such as emotional control, flexibility, goal directed persistence, and metacognition. There are more new games but it may be a while before we get to them. It was so good to see the Monday lunch buddies after the two week winter break. They are engaging with each other in such a natural way. There were big smiles from the adults in the group as the students showed interest in each other and what they did over the holiday. There was no need for prompting as they asked questions and made comments about each others sharing. London Bridge pose-sometimes it is really hard to look at your partner. The Pigeon pose is a real stretch! Community circle is such a sweet moment. I shared my “future glasses” with this group. We talked about picturing or seeing ourselves doing the activity. What materials we would need and what it would look like when it was done. We talked about how much time we thought it would take to finish and used the timer to see if we were correct. 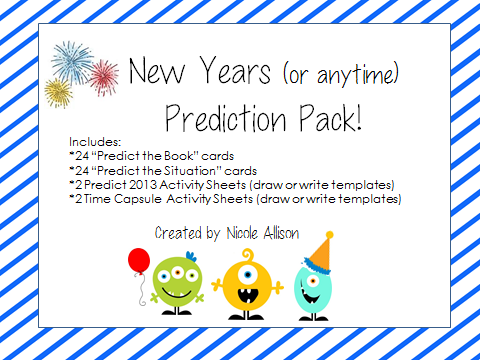 While we ate lunch, we made predictions using the New Years Prediction Pack created by Allison Nicole and available at http://www.teacherspayteachers.com. Check out more of Allison’s creations and visit her website http://allisonspeechpeeps.blogspot.com. Great job today. lunch buddies!